Ellie Cochran is a soon-to-be junior from Atlanta, Georgia, majoring in Religious Studies at the University of Alabama. The following was written for REL 360: Popular Culture/Public Humanities. Regardless of whether we are aware of it or not, we allow for objects to have certain significances in our lives and in the world around us. ‘Meanings’ are given to ordinary, and mainly tangible objects as intentions and emotions are projected onto them for various reasons. In both general, public objects, such as artwork at a museum, and in personal, sometimes ‘sacred’ objects, such as a cherished childhood item or a family heirloom, the deeper meanings given to items can be interpreted in a variety of ways. 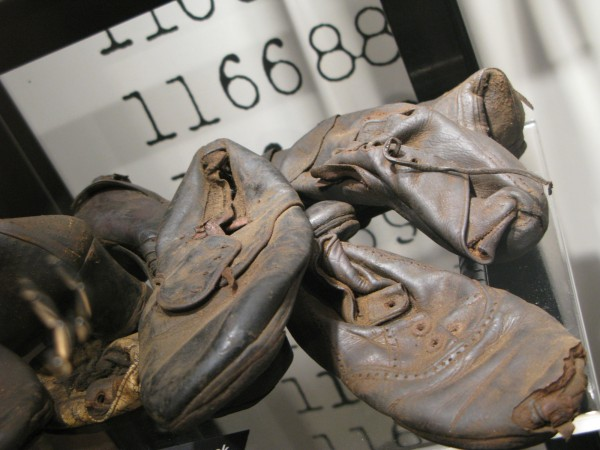 Dr. Levitt, who spoke at the fifteenth annual Aronov Lecture, used both shoes from the Holocaust Museum and various items that become held privately in police custody as her examples for objects that hold significant meanings. There are an endless number of examples where material items may hold meaning for any given reason, because nearly every object in our lives serves a purpose or “means something” to us, but I am primarily interested in why we hold onto these objects, or even showcase them in some situations. As Dr. Levitt pointed out, displaying items in a showcase of a museum and holding objects in the storage area of police custody are extremely similar; the difference is a matter of private and public. The acts of taking an ordinary object and holding it hostage or putting the item in a protective case as if it has magical powers have become so normal in our society, but it is actually quite an interesting process. Items displayed by a museum are particularly interesting because they are chosen beforehand by curators, historians, or anthropologists who are knowledgeable about the backgrounds and histories of the items. In knowing their ‘pasts,’ the historian can plan and decide on how they want the object to be used and who they want to be affected by its story. In addition to curators and anthropologists with PhDs, there are other factors that play a role in determining what objects will be showcased in a museum. Beyond just making a seemingly simple decision to put an object on display, the ‘choosers’ must also be aware that the items purpose within the museum reflects the “right” history—a history that is often influenced by economic and political elite, who may even fund and support the museum itself. In her lecture, Dr. Levitt used shoes from the Holocaust as an example of objects that are meant to convey a specific message, but it seems more interesting to me to ask who chose the items, what history were they assigned, and why. Additionally, who is supposed to be influenced by the historical objects and in what ways are the viewers meant to be affected? The shoes in the Holocaust Museum were most likely chosen to represent the horrific time of human history and are meant to act as a reminder of both the pain and suffering caused to the victims, as well as of the political and social errors that we are to never revert back to. Every museum and every individual exhibit is unique as each has a different ‘meaning’ or purpose to serve. Analyzing and investigating their functions, as well as the ‘choosers’ who determine what is displayed are not meant to be critical or doubting in any way, but there is much more information beneath the surface of the object or the short summary on its history (which was chosen by someone for a specific purpose). To question who decides and why is to learn more about our present (and the current intentions), rather than just the ‘past’ that we assume we are learning about. Current intentions and ideas are being expressed through the very displays and objects that we shove in a box and label “past”. Being aware of these processes and asking all kinds of questions will enrich our understanding of the past, present, and even future. This entry was posted in Religion in Culture, Student Blog and tagged #Aronov2017, Aronov Lecture, Holocaust, Meaning, Museums, Shoes, The Past by admin. Bookmark the permalink. I found your article to be very interesting. I had previously never thought about the fact that what is shown in a museum is as reflective of its curators as of actual history. This distinction can even be applied to words and names, the foundation of communication. Those words and names which are listed to describe the objects in these museums reflect as much on those who coined them as they do of the historical significance of an object. McCutcheon illustrates this distinction in his discussion of the history of Mt. Everest’s name. Mt. Everest, though it is the tallest mountain on the planet, is named not for its inherent qualities (the Tibetans call it Chomolungma– which roughly translates to mother of the universe), but is instead named after the British surveyor who initially recorded its location, Sir George Everest. I use this example simply to show that what we decide to use to distinguish something can drastically affect what people perceive about that object. For example, shoes in a museum. If we simply display these shoes with no message, a museum visitor would not know why they are significant. Similarly, if we display the shoes in say, an aviation museum, we risk losing their value as a relic functional to illustrate the horrors of which humans are capable. As you can see, the distinctions of classification we place on objects has immeasurable power to affect the opinions of those who interact with said objects. As I mentioned, this is present everywhere, even in language. Thus, we must be extremely careful in decisions of classification, as you have suggested in your statement about curators choosing objects to display which cater to a certain demographic.